These decorative crystal ball lights are ideal for decorating shrubs, umbrellas and doorways. There are 30 energy-saving white LED's with transparent crystal ball covers powered by a separate amorphous solar panel allowing lights to be placed in shady areas. 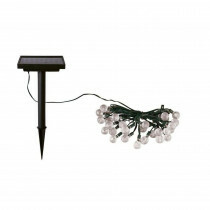 The string of lights are 20-1/2 ft. total and will illuminate up to 6 hours each night when fully charged. Great for year round use. Replaceable rechargeable NiMH battery, no operating costs, no wiring, simply install and enjoy.